Sold by COMACA_SHOP and Fulfilled by Amazon. Gift-wrap available. 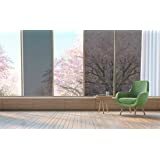 To enjoy the light while not allowing others to see inside, the Window Tint provides daytime privacy to you, just like a privacy curtain only in daytime. Anti glare, thermal windows must unbearable in summer, this window insulation kit has sun block effect. 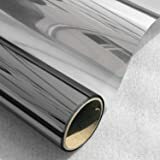 Widely used for residential, home, office, hotels, house, and applicable to any smooth or flat glass surface, like window, sliding door, balcony, etc. 1.One-way daytime privacy depends on the light intensity. In general, people inside can see through the glass window tint, while people outside can’t see people inside during daytime due to the strong sunlight outside; when indoor light is stronger than outdoor at nighttime, people outside can see people inside. Remember to draw curtain during night. 2.Different effect between daytime and night: The outside glass will show a mirror effect and keep your privacy only during daytime. 3.Mirror effect: The mirror effect we said means it has a slightly reflective effect, not totally like a mirror. Step 1. Measure the window, and trim one way static film to required size. Step 2. Clean the window or glass, leaving no oil or impurities. Step 3. 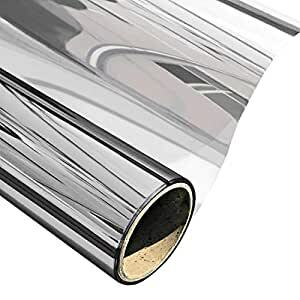 Tear the backing protective film, do not throw away. Step 4. Using a spray bottle, spray soapy water on the surface of the solar film and window. Step 5. 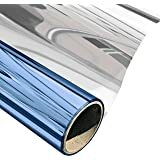 Attach the DIY window tint, cover the backing film on it to prevent mirror film being scratched. Step 6. Squeegee away water and air bubble. Step 7. Peel off the backing film. Step 8. Cut off the excess edges of removable film.